Such a tease! Ryan Gosling opened up a little about the birth of his and Eva Mendes&apos; second baby during a visit to The Ellen DeGeneres Show, which will air Friday, May 13. And the cheeky dad of two even offered to show Ellen DeGeneres and her studio audience a photograph of the newest addition to his family. Of course, Gosling is notoriously private about all aspects of his life (he managed to keep news of his baby&apos;s birth a secret for a whole month! ), so it wasn&apos;t a huge surprise when the photograph didn&apos;t turn out to be quite what he&apos;d promised! But while Gosling was keeping pretty tight-lipped about his newborn, Amada, he did go on to reveal his older daughter, Esmeralda, 20 months (known as "Es" in the Gosling household), is giving him a whole lot of joy. "We go to the park, play with chalk," the hunky star said, before launching into a hilarious tale of toddler graffiti warfare. "It&apos;s funny, because when I was a younger man I had a fantasy of getting into the graffiti world for a minute," Gosling explained. "I heard that if you tag over someone else&apos;s tag, that&apos;s how you start a battle. So I did this for a few months and no one ever bothered to battle with me, because I guess I was so bad at it. So I thought, I&apos;ll hang up my spray cans and that&apos;ll be it." "But now, I take my little girl to the park, and we always write her name in chalk, and some kid has been erasing her name and writing their name over it," he continued. "So now I&apos;m finally in a proper tagging battle. And this kid has access to an unfair amount of chalk. My little girl doesn&apos;t care; she&apos;s like, Well, let&apos;s just chalk anywhere else. And I&apos;m like, &apos;No! They&apos;re disrespecting your mother, because she gave you this name, and they&apos;re erasing it. So the only way to really get back at them is to erase their name. 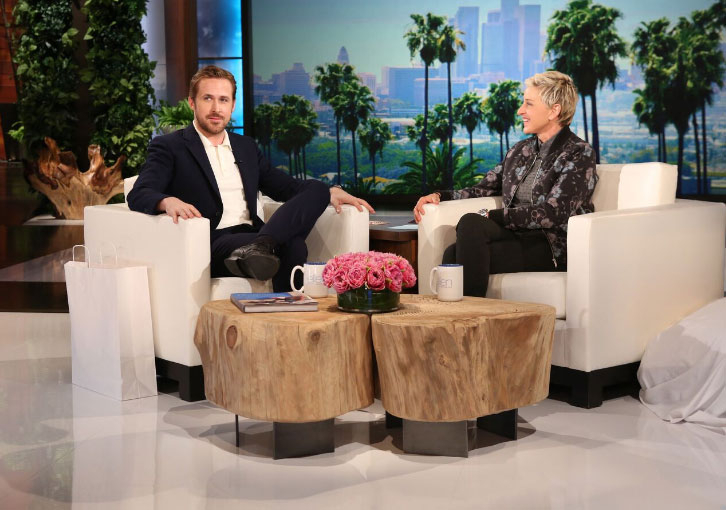 And not disrespect their mother, but definitely put her on notice.&apos;"
Watch the funny interview in the video above and see what picture Gosling really presented DeGeneres with in place of a photo of his newest arrival.